The attempt to reconstruct religious practices and ideas from buildings and pictures is fraught with danger, but some deductions can be safely drawn. 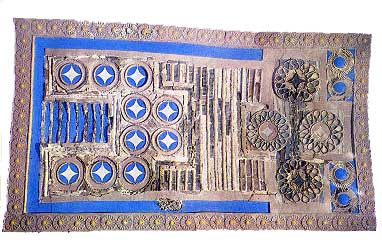 Minoan sites normally do not possess separate buildings identifiable as temples, though a curious exception to this rule has been discovered at the Minoan "colony" on Keos. Special rooms and areas of palaces and important houses were set aside as shrines for ritual purposes. Large cult images are not normally found, but again Keos is an exception. The most characteristic religious symbols are the double ax and the U-shaped "horns of consecration." Cult figurines, however, are plentiful. Many are crude and roughly made of terra cotta. The most common type is of a standing female figure with uplifted hands. Several figurines of fine workmanship show the goddess dressed in the height of Minoan fashion, holding a snake in either hand. Snake cults survived into classical Greece, where they were associated with the god of healing. Outside the palaces, cult places were set up in two types of location. High on the mountains, often on a conspicuous peak, small sanctuaries were built. They were probably occupied only once a year for a festival, like the modern Christian chapels in similar locations. Offering-tables and jars found on these sites indicate that agricultural produce was offered here to the deity. Caves also were treated as sacred. Some of these, too, were high in the mountains, but a more accessible one at Amnisos near Knossos had a long history, receiving offerings from the Middle Minoan down to the classical period. During the Late Minoan II period Greek archives of Knossos record offerings of honey sent to this cave for the goddess known to the later Greeks as Eileithyia, the patron of childbirth. This cave is mentioned by Homer in the Odyssey. Later tradition told strange tales of Cretan deities, especially of a Zeus who died and was periodically reborn. How much of these traditions was founded on Minoan beliefs is impossible to say. Clearly, when the Greeks took over Crete they absorbed the local cults into their own polytheistic religion, identifying Cretan deities with their own. 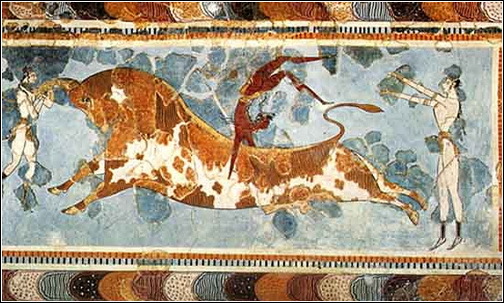 A painted sarcophagus from the Greek (Late Minoan) period has been interpreted as depicting the soul's journey to the other world and religious rites in connection with the dead. As usual, such pictures provide a glimpse that is only tantalizing, so long as they cannot be associated with a written text.